10 Years has been a band that has consistently turned out quality product since their major label debut The Autumn Effect in 2005. Last year, the band decided to do something that is almost unheard of. After achieving critical and commercial success for several years, they decided to release their new album independently. It’s definitely a very risky move that the band felt committed to in order to move forward in their career. After listening to their newest album Minus the Machine, it just may be the smartest move of their career. The new album is almost a return to roots for the guys. There’s no label pressuring them for a hit single. There are no suits telling them what they are supposed to sound like. The reigns have been handed back over to them and they are finally free to create exactly what they want to create. I think the results will surprise some people are the band definitely explore outside of the box on this album. I also think it’s safe to say that it is the darkest album that they have created to date. Wait, don’t start to panic because it’s still the 10 Years that you have come to love, just free of restrictions. A band without limitations is a beautiful thing. 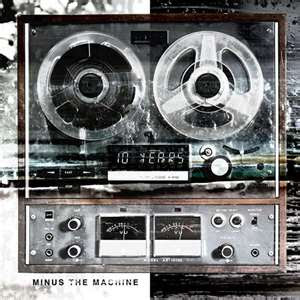 The album opens with the title track “Minus the Machine” and the door inside of 10 Years that has only been cracked open until this point is suddenly ripped off the hinges. What a great song to open with as if to tell the fans: this is us, this is who we are. On this track, all the pieces of the band come together to make this one hell of an opener. It’s slow and melodic until the chorus and has the big crashing guitars that resonate on the chorus. “Writing on the Walls” is the first track that will really have you doing a double take. It starts with some type of backwards masking that leads into a delicate ukulele and piano. Jesse’s vocals are very passionate elevate this song to another plateau. It’s a beautiful song both musically and lyrically. The middle of the album tends to tread familiar ground for the band. Song such as “Soma” and “Sleeper” do seem to have that familiar sound that longtime fans of the band will immediately recognize. By this time, I am sure that most of you have heard the first single “Backlash”. If you haven’t, then you definitely need to check it out as well as the visually intriguing video for it. “Tightrope” finds the band venturing out of their musical box and treading some unfamiliar ground. The song has somewhat of an industrial feel to it, which I am pretty certain the band has not ventured into up until this point. I am sure this will be another track that will catch people off guard, maybe just a bit. One of my favorite songs on the album is “Forever Fields (Sowing Season)”. It’s a tranquil number composed almost entirely of a lone, haunting piano. It’s another example of how less can sometimes be more. The crashing guitars are stripped away as well as the thundering drums, yet the song soars above some of the other monstrous songs. The album closes with two stand-out tracks and probably two of the most creative songs that the band has created to date. “Birth-Death” is a slow, somber piano driven instrumental that is accentuated by a string section and it flows right into “…And All the Other Colors”. The drums will definitely catch your attention on this one as they have a type of jungle or tribal feel to them. A slow starter that builds as it progresses into another powerful number. The band has a renewed sense of direction and they sound hungry. I feel as if breaking away from the major label and being able to have full creative control has sparked something in the guys that may have been suppressed by the label and the suits. They definitely step outside the box quite a few times and show us a side of 10 Years that we haven’t seen before. Lead singer Jesse Hasek’s vocals sound stronger and more passionate than ever. The remaining band mates, Brian Vodinh on drums and guitars, Ryan “Tater” Johnson on guitar and Lewis Cosby on drums, sound tighter and more focused than ever. 10 Years have already experienced commercial success before, but it will be very interesting to see how this release plays out. This may very well be the best that the band has recorded to date. It’s as if every song from the first track to the final could be a single. I don’t think there is any filler on here at all. Yes, it’s that strong of a record. If this is any indication of what happens when a band jumps ship to follow their hearts instead of their checkbooks, other band may try to follow suit.